Find My Workspace lists over 95% of the business centres market in Ely. Simply click Request Quote to check pricing for one office, or Add to Basket for multiple offices. Once a Victorian school, this unique building has now been sympathetically extended and divided into two floors. Its stunning exterior is matched inside, with exposed beams, feature windows and cosy feel. There are several spaces on offer, from private offices, to an office suite with kitchen facilities, to shared coworking space. You will share the space with other friendly businesses and share in the community feel of the centre. The centre offers reception services, internet and telephone answering services for tenants, easing the transition into your new office, as well as parking and postal facilities and mail handling. This serviced office is part of a complex made up of seven offices, available now from £425 per month. 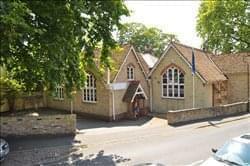 The building is purpose built and in a quiet location, providing a peaceful setting for your business. The rental price is inclusive of all utility bills for your convenience, with broadband and £50 of electricity usage accounted for. The space itself is bright and airy, ensuring a pleasant and productive work environment. Tenants will benefit from great accessibility, with on-street parking for those who drive and Ely’s railway station only a short walk away. There is a cloakroom facility, a communal kitchen on-site as well as a vending machine for tenants’ use.